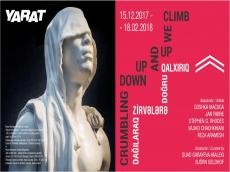 YARAT Contemporary Art Space invites you to enjoy a new group show "Crumbling down, up and up we climb" from December 15 to February 18. The exhibition explores attitudes towards cultural histories and monumentality as well as the constant human condition of entropy and re-awakening. Through works by Reza Aramesh, Vajiko Chachkhiani, Jan Fabre, Goshka Macuga and Stephen G. Rhodes, it draws upon the ambivalent ambition to move forward while continuously struggling with loss and forgetfulness. Vajiko Chachkhiani’s But Ah, My Foes, And Oh, My Friends (I) (2016) – a candle burning at both ends – opens the show in conversation with his film Winter which was not there(2017). A middle-aged man from the Caucasus, driving with his dog through picturesque Georgian landscape, drags an incongruous Socialist monument behind his truck. The seemingly ordinary road trip thereby signifies the loss of history carried by the generation who lived it. The narrative of inevitable loss is strengthened by the apocalyptic installation of Stephen G. Rhodes Willkommen Im Vile Assumption Haven: Or The Private Propertylessness and Pals (2017). The work highlights the catastrophic consequences of refusal to acknowledge the environmental and economic collapse facing our generation, specifically drawing on both recent and historical experience of New Orleans. In the next room, two tables from series Before the Beginning and After the End, (2016) by Goshka Macuga present scrolls of drawings made by robots (developed by Patrick Tresset). Archiving the progress of civilization, they present a journey through creative and destructive processes of humanity. Humanity’s Awakening and Destructive Nature of Humankind carry both local and universal historical and artistic artifacts from pre-historic arrowheads to contemporary sculpture. The installation suggests technological advancement through robotics as the next step in creation of knowledge and cultural production. Opposed to robotic drawings is the monumental hand drawn canvas L’heure Bleu (1987), by Jan Fabre, symbolizing the mystical hour when the animals of the night fall asleep and the animals of the day awaken. Emphasizing the regenerative power of nature the work evokes the continuous cycle of rebirth both as a natural and creative process. Caught between radical technologies, overpowering nature and uncontrollable socio-political turbulence humanity finds itself once again in a precarious position. The larger than life sculptures by Reza Aramesh Site of the Fall- study of the renaissance garden (2014 – 2017) herald the rise of a new hero – a victim rather than conqueror, bringing to memory the destruction of monuments of the old. Juxtaposing five artistic positions as different proposals for a way forward, this exhibition acts as a verse on humanity faced with its own limitations, like a candle burning at both ends. Reza Aramesh (b. 1970, Ahwaz, Iran) lives and works in London, UK. He completed an MA in Fine Art at Goldsmiths, University of London, in 1997. His works have received international acclaim and has been featured in solo shows in Frieze Sculpture Park, London (2017), Leila Heller gallery, Dubai (2016), Centrefold Project, Sazmanab, Tehran (2015), Leila Heller Gallery, New York (2015), Isabelle Van Den Eynde Gallery, Dubai (2011), Late at Tate Britain, London (2009), Shcontemporary, Shanghai, China (2008), Barbican Art Gallery, London, UK (2007), Matthew Bown gallery, London, UK(2007) and a number of group shows and fairs such as Art Basel Parcours (2017), Frieze Sculpture Park (2017, 2015), MAXXI Museum Roma (2016), Venice Biennial (2015) etc. Vajiko Chachkhiani (b.1985, Tbilisi, Georgia) lives and works in Berlin. He studied Mathematics and Informatics at the Technical University, Tbilisi, Georgia before turning to Fine Art, which he studied in the class of Prof. Gregor Schneider at Universität der Künste (UdK), Berlin, Germany, and Gerrit Rietveld Academie, Amsterdam, The Netherlands. Solo exhibitions include GRA Glass Pavilion, Amsterdam (2009), Gallery Gala, Tbilisi (2011), BINZ39, Zurich (2012), The State Museum of Literature, Tbilisi (2013), and Museum für Gegenwartskunst, Siegen, Germany (2014). He was awarded the prestigious 7th Rubens Promotional Award of the Contemporary Art Museum Siegen (2014), and was accepted for the ISCP Residency Program, New York (2016). Jan Fabre (b.1958, Antwerp, Belgium) lives and works in Antwerp, Belgium. Fabre studied at the Municipal Institute of Decorative Arts and the Royal Academy of Fine Arts in Antwerp. His most recent solo shows include Galerie Daniel Templon, Paris (2013), MAXXI Museum, Rome (2013), PinchukArtCentre, Kiev (2014), la Maison de la Culture, Saint-Loup Church, Namur (2015), Wetterling Gallery, Stockholm (2015), MUHKA, Antwerp (2015), Espace Louis Vuitton, Tokyo (2015), DEWEER Gallery, Otegem (2015), L’Abbazzia di San Gregorio, Venice (2017) etc. Goshka Macuga (b. 1967, Warsaw, Poland) is a London-based artist. She studied at Central Saint Martins School of Art, and at Goldsmiths College, London. Throughout her career, Macuga’s work has embraced diverse mediums including sculpture, installation, architecture, and design. Among recent solo shows are: Now this, is this the end the end of the beginning or the beginning of the end? Schinkel Pavillon, Berlin (2016); Goshka Macuga: Time as Fabric, New Museum, New York (2016); To the Son of Man Who Ate the Scroll, Fondazione Prada, Milan (2016). Stephen G Rhodes (b.1977, Houston, USA) lives and works in Los Angeles, USA. He received his MFA from Art Center College of Design, Pasadena (2005). His solo exhibitions include A good neightbour (2017), Sweethaven Assumption or The Propertylessness and Pals (2016), Or the Unpreparedness Prometheus and Pals (2015), The Eleventh Hobby (2014), The Law of the Unknown Neightbour (2013) etc., and number of group exhibitions in Gallery Micky Schubert (2017), Galerie Eva Presenhuber (2016), Eden Eden (2015), KW Institute of Contemporary Art(2015), Chateau Shatto (2014), Palais de Tokio (2013) etc. The exhibition is curated by Suad Garayeva-Maleki and Björn Geldhof. Admission is free. The exhibition is open form Tuesday through Sunday, from 12 pm – 8 pm.